Well, it finally happened. The oldest little chick has left the nest. She got herself a wonderful job in Norfolk, VA and we moved her down last week. She starts tomorrow. How cute is her apartment??? 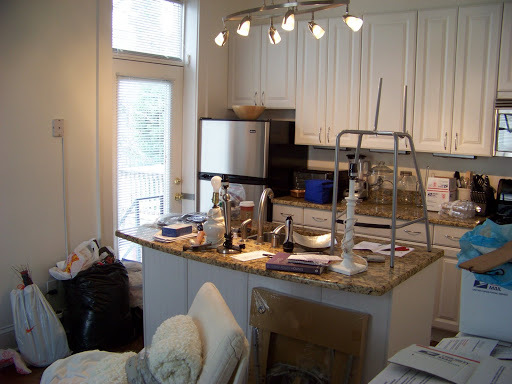 She will be completely embarrassed that I am showing pictures of it in this state, it looked much better within hours of this shot, but isn’t beautiful, granite counters, folks. I don’t have granite counters. 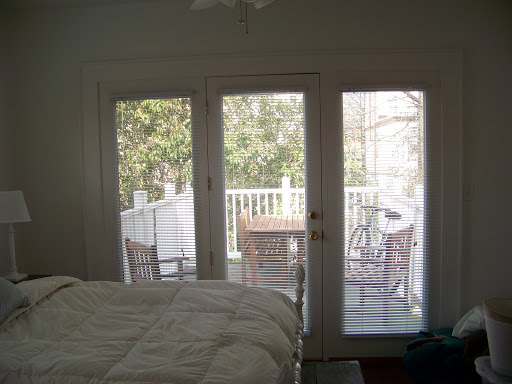 Her bedroom is full of light and has this wonderful deck right outside her door. 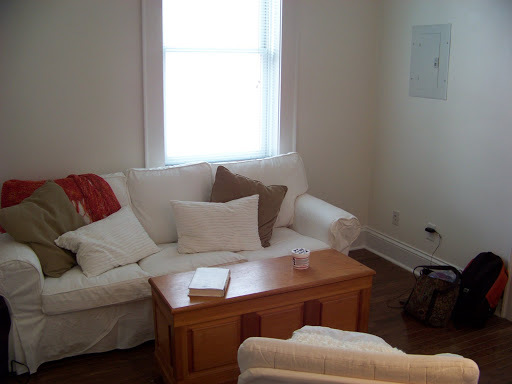 The living room is small but it will be cozy. 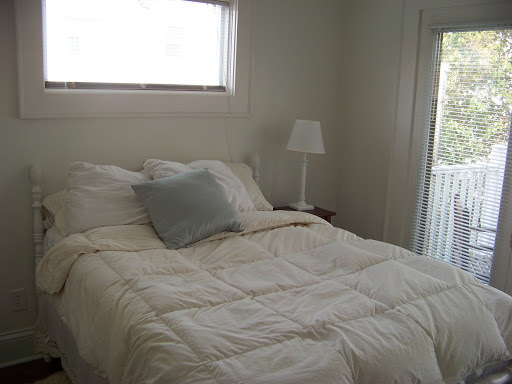 We will move onto other things now so I can stop thinking about her empty room upstairs. 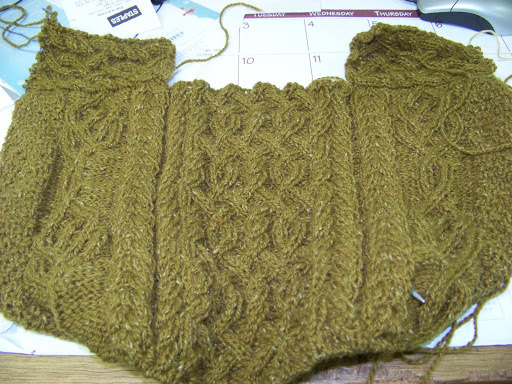 I have started a Janet Szabo inspired FLAK sweater for DD#2. The yarn is Devon from Classic Elite, unfortunately, it is discontinued and I am not sure I will have enough to finish. Short-sleeved wool Aran, anyone? 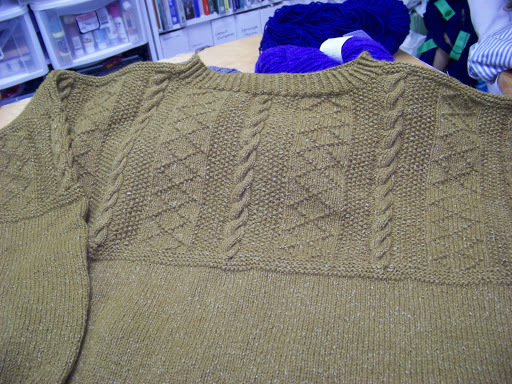 The yarn was left over from this Gansey. I knit for a very good friend a few years ago. He and my husband built me a beautiful chicken coop in trade for this sweater. He is a very large man( this is 61″ at the chest) so I bought lots to be sure I would have enough. I thought I had a ton left over but all the cabling is really eating it up . At this point I think I will stop working on the back, pick up for the front (this is worked top down). 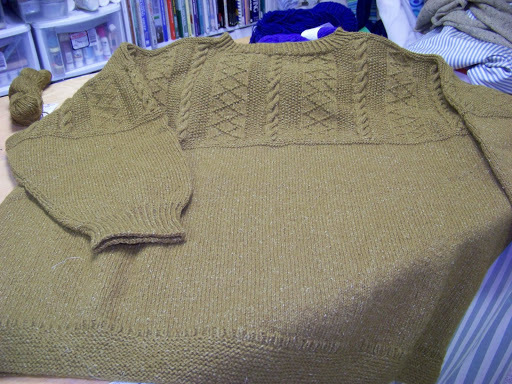 See how far I get and whether I will have enough left for the sleeves. Seems awfully heavy for a vest and I know she wants a really cozy warm sweater soooo…. 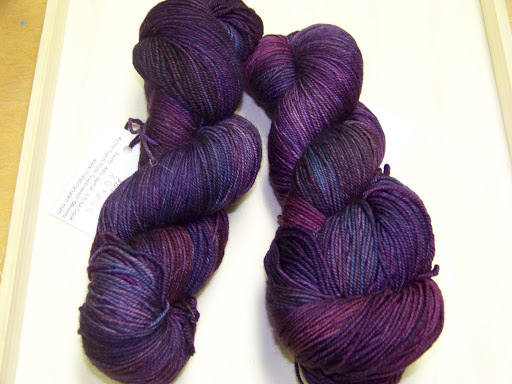 if anyone out there has any Classic Elite Devon in color Brixham Brass #9363 (it is a kind of brassy, mustard color) who would be willing to part with a few skeins I would be eternally grateful and willing to pay dearly. 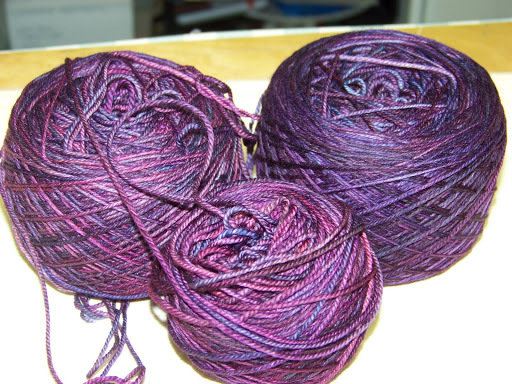 She loved this yarn and the color will look amazing on her. 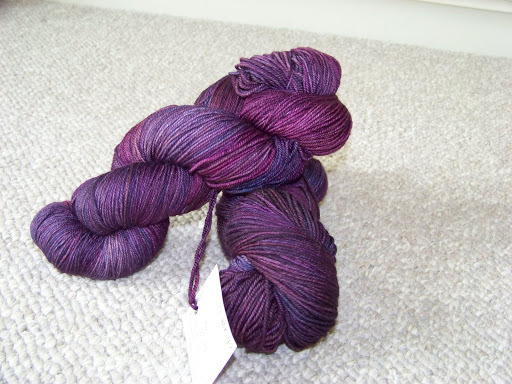 I also ordered this Malabrigo Sock Yarn from Webs back in October so what a surprise to receive this in the last week. Of course I want to stop everything else and be alone with this but I will soldier on and finish all the heavy wooly things I must with this as the shiny holy grail of knitting at the end. I think it wants to be a shawl don’t you? read every word and drooled over the photos. unbelievably impressed. feel i have little to show for myself.